It now is a generation in the past. Exactly twenty years ago today. 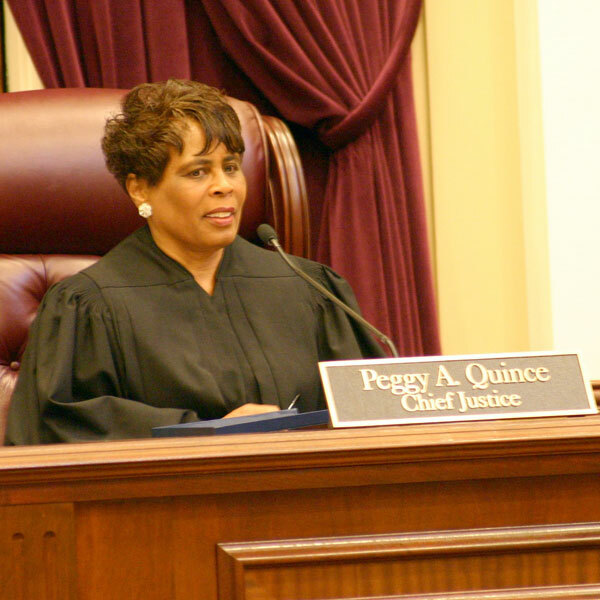 On December 8, 1998, a lower appeals court judge and former Central Florida assistant attorney general named Peggy A. Quince was elevated to the Florida Supreme Court by Governor Lawton Chiles. She was the first African-American woman ever appointed. Her life had begun in the segregated towns of Virginia near the nation's capital where her father labored long and hard as a longshoreman to put food on the table. Quince rose up through academic excellence, went to law school, and eventually came to work in Florida handling appeals for the Attorney General. From 1993 to 1998 she served as a Judge on the Second District Court of Appeal in Lakeland. But other unforeseen events in 1998 made Quince's appointment to the Florida Supreme Court doubly and triply historic. Only four days after appointing her, Governor Chiles died of a heart attack in the exercise room of the Governor's mansion. And his death set in motion one of the most extraordinary events in the history of the Florida Supreme Court. The vacancy on the high court that eventually was filled by Quince already had been bitterly disputed. It nearly led to a major constitutional lawsuit between Chiles, the outgoing Governor whose term soon would end, and Governor-Elect Jeb Bush who would take office only days later. Jeb Bush contended the appointment was rightfully his to make as the newly elected Governor. Lawton Chiles insisted it was his. But in behind-the-scenes negotiations, the two Governors reached a compromise. News reporters at the state capitol were shocked on December 8, 1998, when they arrived in the Governor's press room anticipating the first volley in a lengthy, headline-grabbing lawsuit between Chiles and Bush. Instead, they found both Governors standing together in the television lights to announce Peggy Quince as the state's newest Supreme Court member. Reporters peppered the two men with questions about what had happened. Lawton Chiles stepped forward to explain his compromise with Jeb Bush. "Peggy was the first choice for both of us," Chiles said. "I consider it mine. He considers it his. We consider it ours." A lawsuit between the two Florida Governors had been avoided. Or so it seemed. But Chiles' death just four days later added another startling complication. Before he died, Chiles had not yet signed the official papers finalizing Quince's appointment. Was the historic deal off? Everyone waited to find out. Lieutenant Governor Buddy MacKay had been sworn into the state's highest office for the 23 days remaining in the late Governor's term. He could have done anything he wanted as the new, if temporary, Governor. But MacKay felt that any renewed infighting was not in the best interests of the state and its people. So MacKay agreed to sign the official commission papers naming Peggy Quince to the Court, honoring his predecessor's novel compromise with Bush. MacKay then did something completely unprecedented, that no one expected, and that the law did not require. He let Jeb Bush add his signature to the document as Governor-Elect. Florida's government was acting with unified purpose at a time of transition. And that is how Peggy A. Quince became the only Florida Supreme Court Justice in all of state history to be appointed simultaneously by three different Governors. Justice Quince will retire in early January. For more information about her historic career, read the biography written by state courts writer Beth Schwartz.